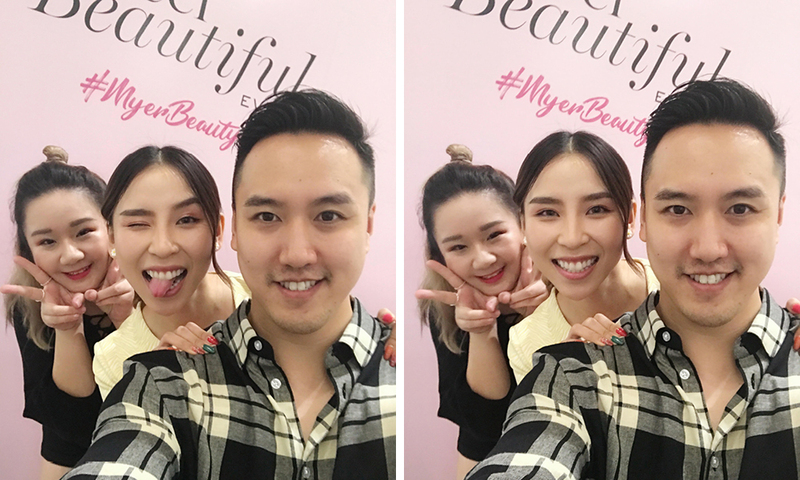 Diary: Myer Beauty Masterclasses | Meeting Tina Yong and Learning from YSL – Oh My Stellar! I found out about the Myer Masterclasses on Instagram via Tina Yong‘s Instagram – where she advertised that she would be holding some lessons at the department store that is close-ish to my work place. I really didn’t want to miss out on these, partly because I’m a big fan of her videos (and I’ve been binge watching the Tina Tries It series pretty often) and also because the prices were pretty good. 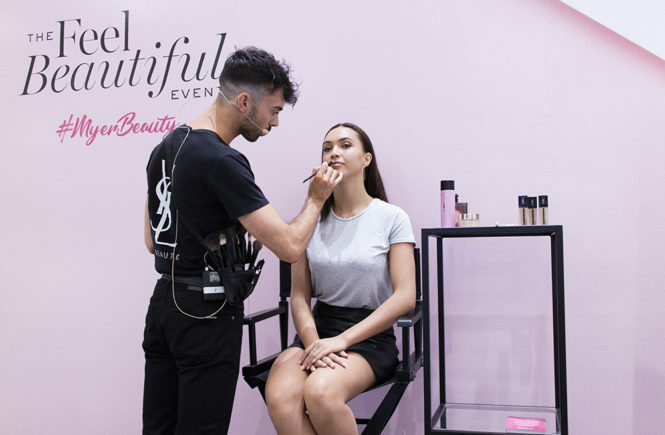 In addition to this class with Tina, I also chose to attend two other masterclasses with another two brands – YSL, which was on the same day, and MAC Cosmetics, which is next week. 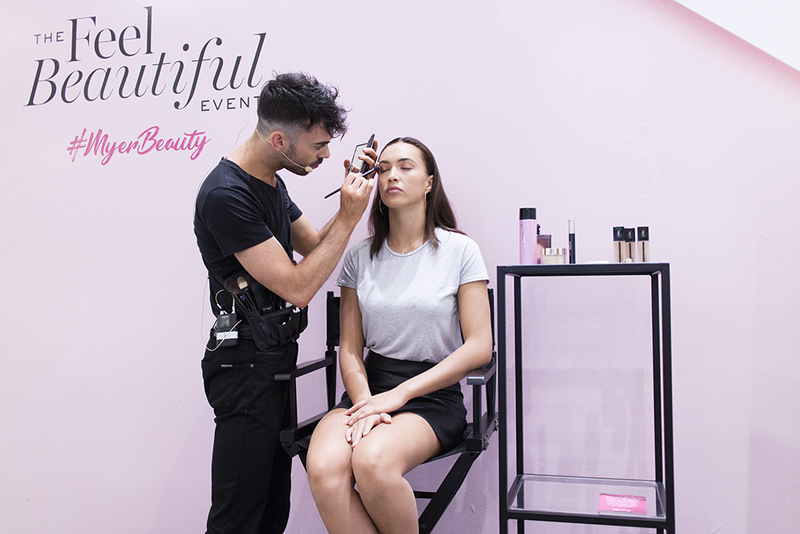 The brand masterclasses were AUD$25 each and the lesson with Tina Yong was AUD$50 – both of these classes also include gifts from the brands which more than make up for the cost of the seat. Both of these classes have different topics. For Tina’s class, it was mainly about easy and useable daily make up tips (focusing on a fresh and radiant look) which are suitable for people on the go. 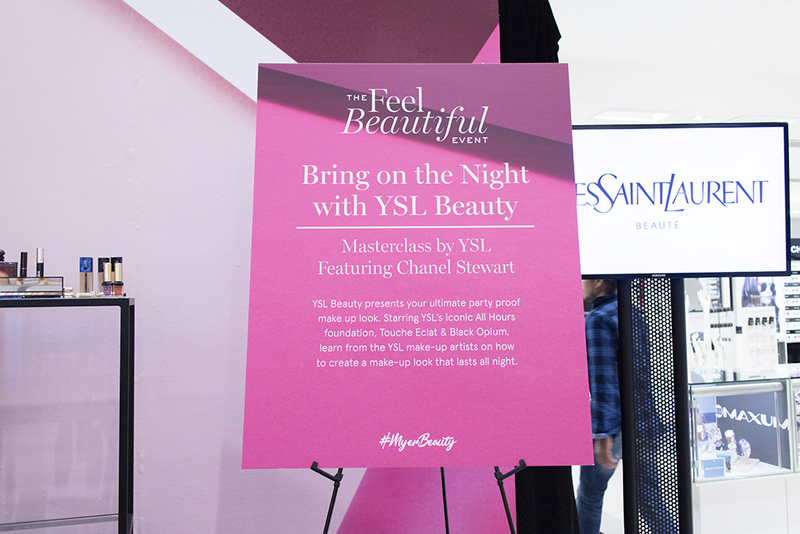 I ended up attending these class with two of my friends but I went to the YSL class alone – this was more about night time make up and introduced a lot of the YSL brand (and I love their brand). We got there in the morning at about 9:30am and I don’t think I’ve ever seen the place so quiet! I guess that people are scouring the beauty department on a Saturday morning, but it did give us some time to find the place and look around before getting seated. I wish that I got a photo of the set up but there were basically rows of tables and high make up chairs, along with individual mirrors. Once we were all seated, Tina came out! She was so sweet and all smiles even early in the morning. Honestly, she seems like such a genuine and relatable person and I think that everyone left this even with a great impression of her. 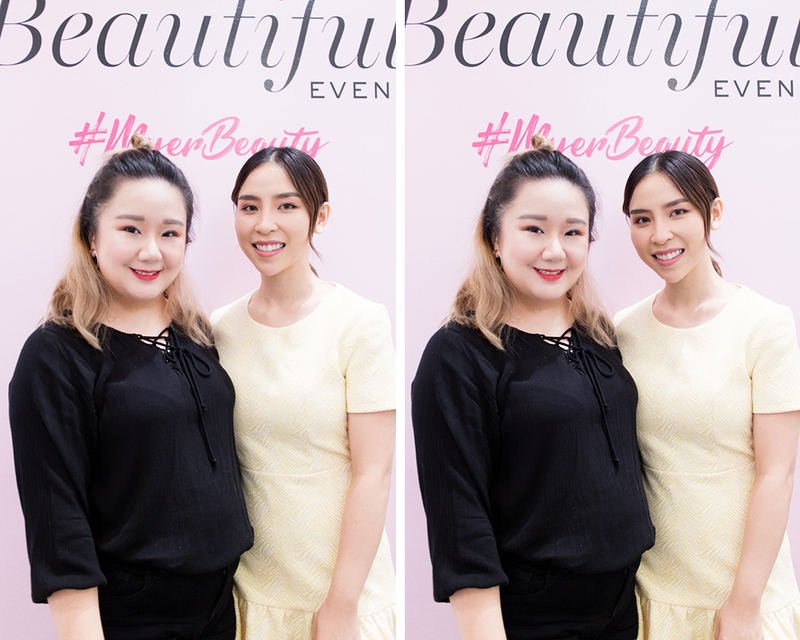 She came out with her base make up completed (introducing us to the Estee Lauder Double Wear foundation that she was wearing) before talking us through a quick make up routine and giving us small tips along the way. There was a focus on multi-use products (like a cream blush that could be used for eyes, cheek and lips) and most of the make up was applied really simply with fingers or just a blending brush. She also gave us quick pointers on face contouring, as talked about the difference between a contour product and a bronzer. This class was definitely something that would be good for those who are working and on the go a lot. Overall, the look that she introduced was very natural and casual. It isn’t exactly my sort of style (as I was just telling my friend before the class that I don’t go out without a full face of make up purely out of habit) but I still enjoyed the products that she showed us. They passed all of them around for people to try out and I’m actually really interested in trying the 3INA eyeshadow that we tried! 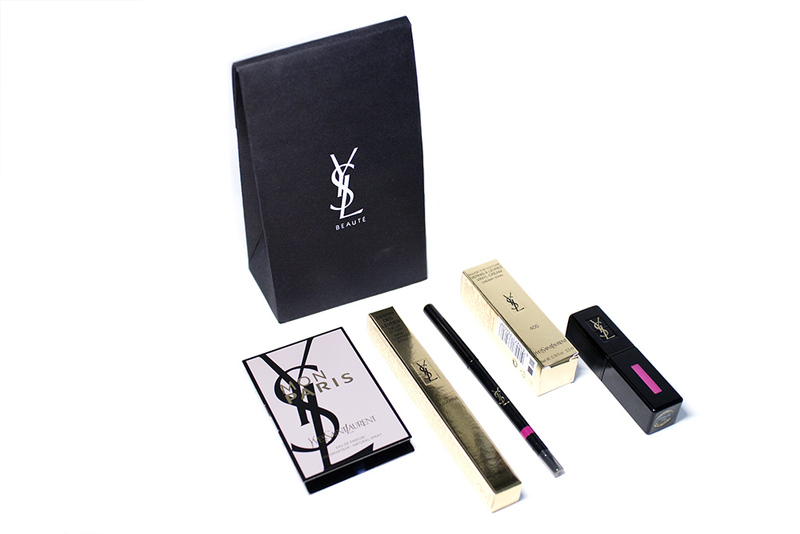 The pigmentation and formula was really great – super pigmented and blendable. 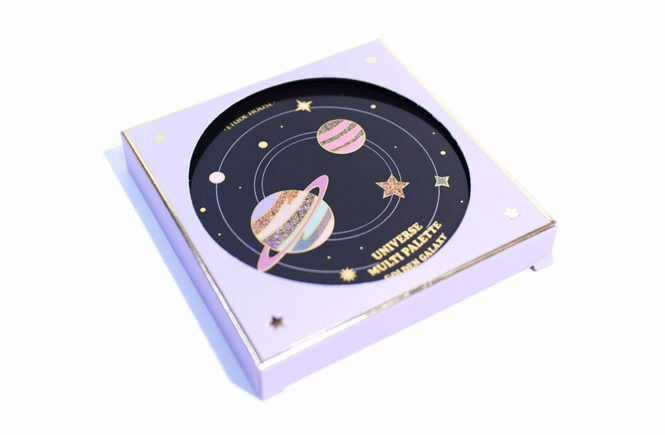 We had a look at it before the class but I can’t remember the price of their single shadows… as reference though, their blush is AUD$15.50 – which is basically drugstore price here! We also tried out the Benefit Hoola Bronzer, which I know of but haven’t actually used before. I did a quick swatch of it and it seemed much too warm for my skintone but it actually applied pretty well. I think that I may also pick up a mini of that to try out sometime. Tina’s tip: When you want to contour your cheeks, follow a line from your ear to the corner of your mouth, going underneath your cheekbones. How far down you take the contour line is up to you, but keep in mind that going too far forward can make your fake appear sunken. Apart from makeup tips, she also talked a bit about her journey as a make up artist and beauty influencer. 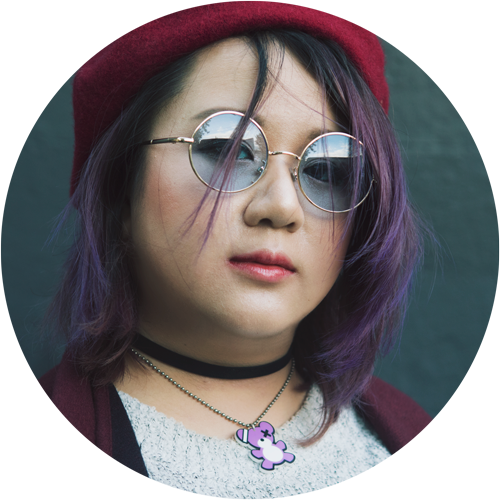 She talked about why and how she started her channel, as well as her experiences as a freelance make up artist here in Sydney. And after the class, we also got to briefly chat with Tina and take photos! Her boyfriend, Alfred, was there taking photos on the day and he helped everyone take photos (as a selfie, which you can see on my Instagram). She’s honestly so beautiful in person and I love that she has such an approachable vibe. For someone who is so successful, Tina comes across as being very grounded and happy to share with the people around her. The class ran for around an hour. Afterwards, I went to look around the store and get myself a drink, which was much needed considering how sleepy I was, before heading back in for the YSL Beauty class. 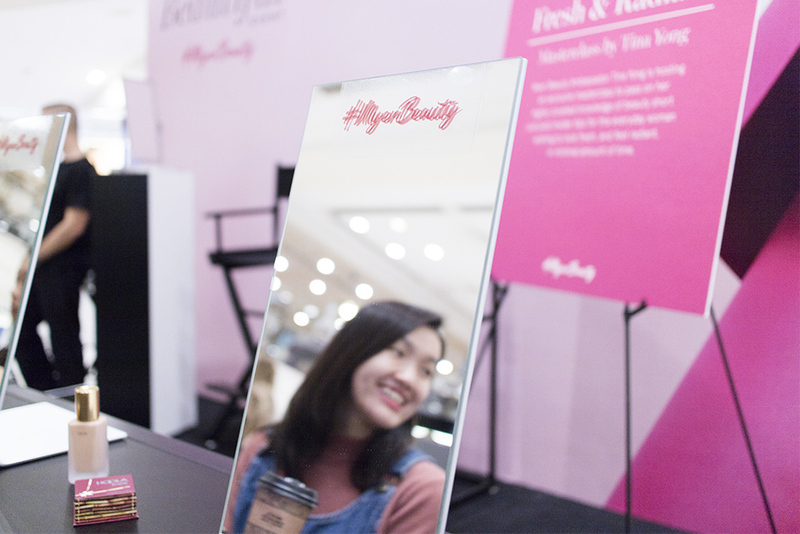 The YSL Beauty class started an hour later and it was a big different to the Tina Yong class in that we didn’t have the mirrors to try and recreate these looks – though I really wish that they did. Instead, they demonstrated these products on the model (this stunner Chanel Stewart) and we were shown a classic, day time look and how to take it to a night look easily. The make up artist (Jas Branigan) that showed us is from YSL and has worked backstage in fashion shows and with celebrities too, so he showed us a lot of his application techniques. 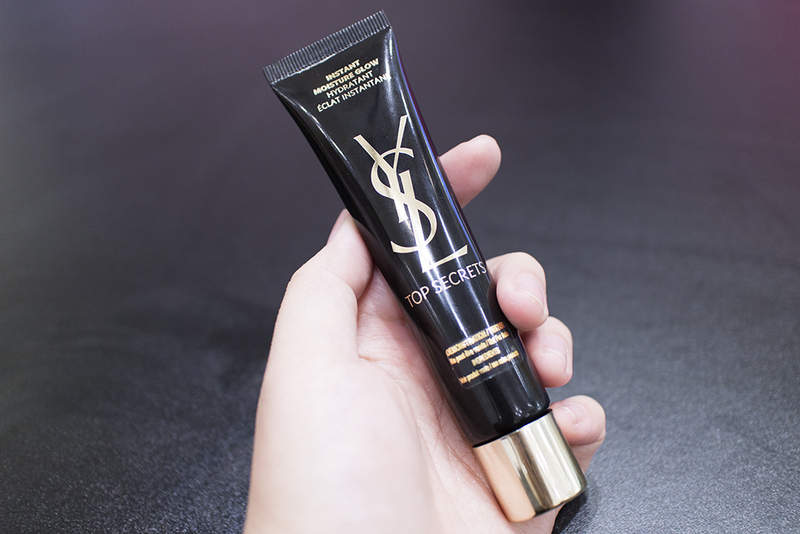 I was really interested in a lot of the YSL products that he introduced (which I’ll show a bit further down) and it was great that, even for a party look, the brand seemed to really focus on bringing in natural radiance. The overall concept was mature and sophisticated, as well as super wearable for all ages. Jas Branigan was really great at explaining the process and the thinking behind what he applied. Jas Branigan’s tip: Build your colours on in light layers – it is always easier to add more than it is to subtract. Since a lot of Jas’ experience is in fashion (naturally), he talked about how most of the products that he showed us were in his make up kit – in fact, he explained that that was sometimes all he had in his make up kit. 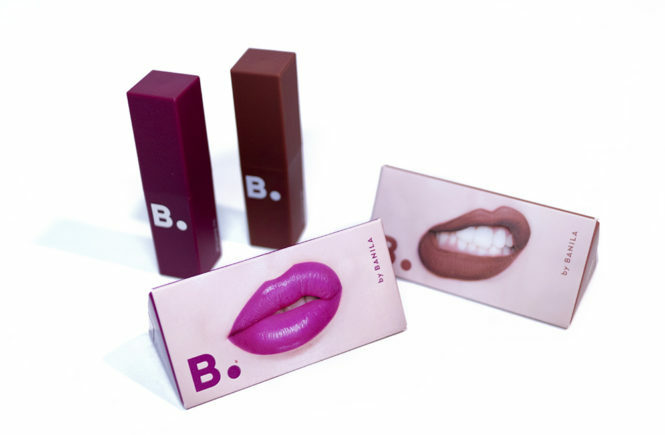 There were some products (like a liquid cheek product) that he also used on lips and eyes. However, his light technique with a blending brush (which was also all that he needed) could build so much dimension on Chanel’s face that it didn’t look as though she was wearing so little. Personally, I thought it was so great to see a make up artist work. When we watch so many Youtube videos, it can really give us the misconception that we always need more and more make up (something that I’m very guilty of) but it takes a skilled hand to step back and show that heavy products aren’t always necessary – though also don’t hurt. Even when he took the model’s look from day to night, all she needed was a bit of dark eyeshadow on her lower lash line to smoke out the eye look! One of the first products that he showed us, and that I’m interested to try out, is the above primer. 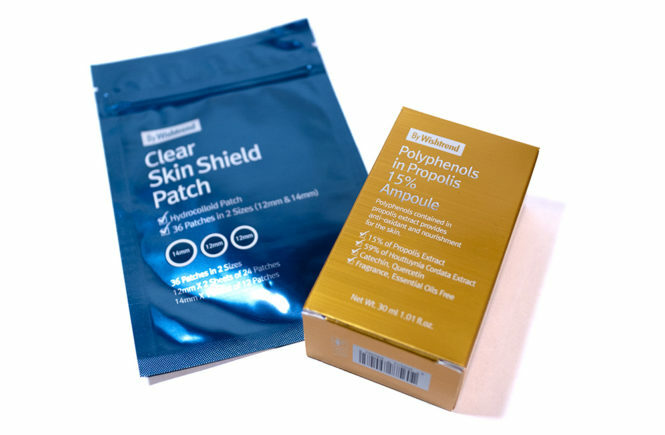 One of the unique technologies that this product uses is called Neo-skin Powder, which adapts to temperature and humidity to help make up wear better – this is particularly great in a country like Australia where, honestly, I feel like I’m constantly sweating. 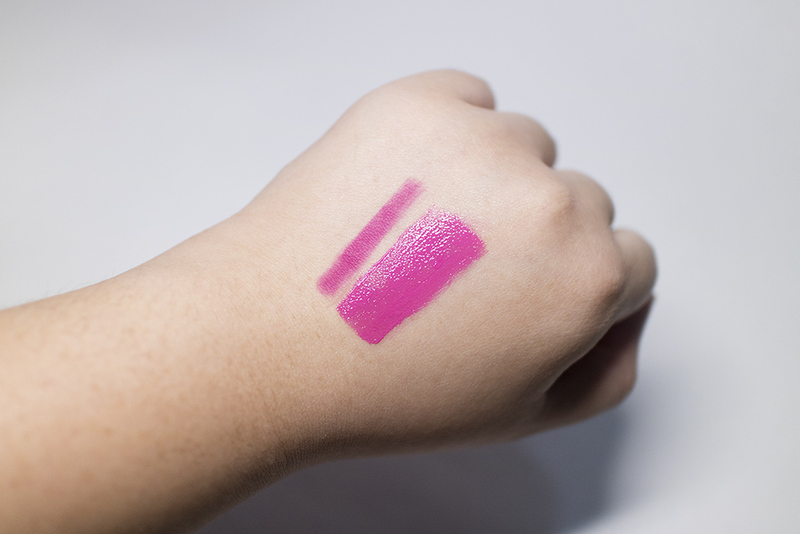 It’s also super lightweight and, when I tried it out on the back on my hand, it melts into a water like consistency so it isn’t greasy or tacky on the skin at all. 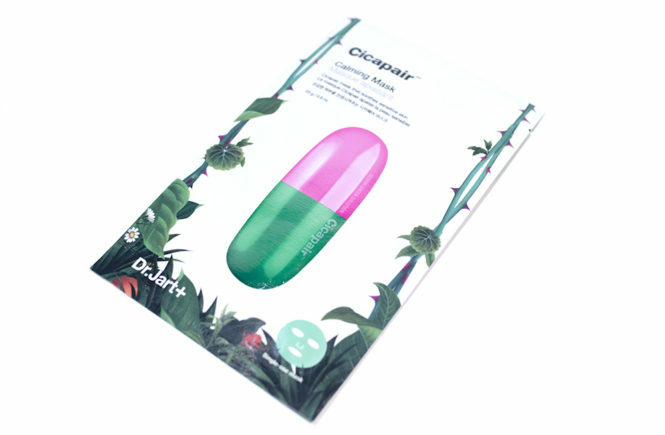 In fact, it left my skin feeling very hydrating and refreshed. A tip from Jas is that you can actually take this and apply it on top on your foundation during the day (in a pressing motion) if you need a quick refresh. Another product that is great for retouching during the day, as well as your make up routine in general, is the classic Touche Éclat. 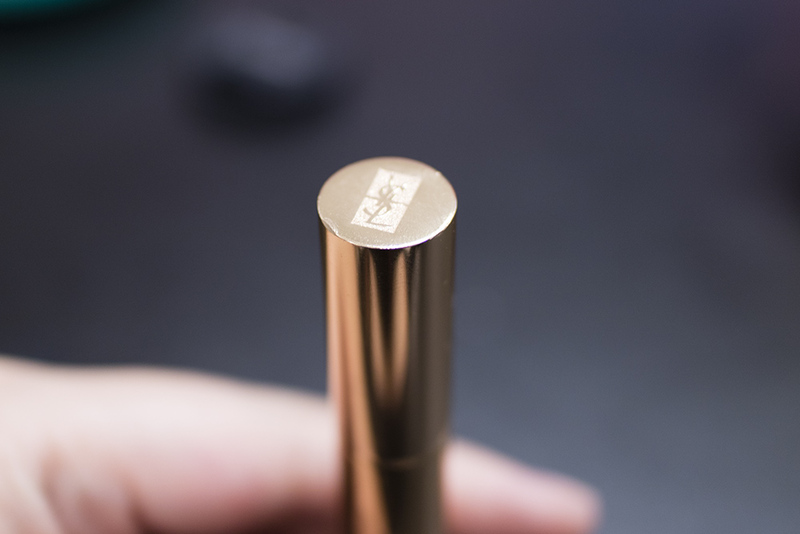 I’ve heard a lot about this concealing pen but it’s actually the first time that I’ve tested it out. 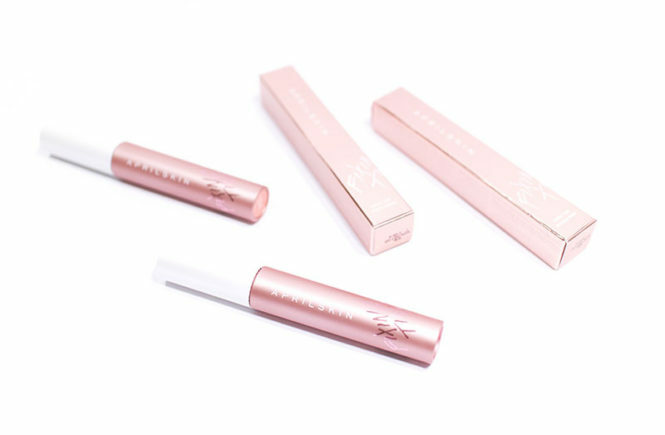 I used it on my undereyes – which were getting a bit patchy and dry by this time – and the formula was super hydrating on my skin and it made me look so awakened. I kind of wish that I could apply it all over my face. 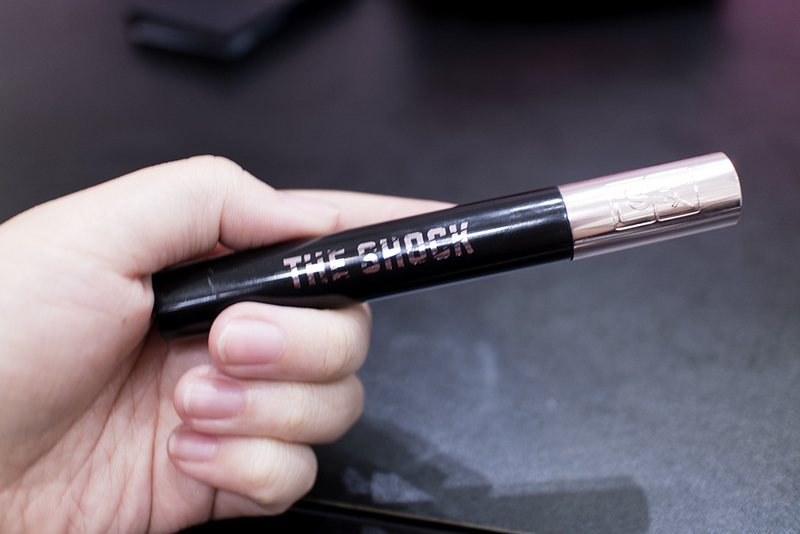 This is a concealer pen that clicks out but it also doubles as a highlighter (another of those multi-use products that they were demonstrating) and Jas Branigan showed how strategic placement of it could really awaken the eyes without needing too much product. Jas Branigan’s tip: Apply to product to the two corners under the eyes (like an inverted triangle) and blend out. You can add more if you need more coverage, but only a small amount is necessary. Aside from under the eyes, the pen can also be used as a highlight (brow bone, cheeks, nose and cupid’s bow) – of course, this will also depend on the shade that you’re using. After trying this one out, I’m super interested to get one for myself because it just looked so great on my skin. It is rather expensive, as you would expect the brand to be, but I think that I may make the investment. And above is the finished look on Chanel. I love the natural brushed brows that he did (and I wish that I had enough natural brow to do that myself) and how there’s great dimension on the eyelid even when it’s such a natural style. The skin also looked really luminous and flawless – though I know that it doesn’t translate as well in that photo because of the poor lighting. 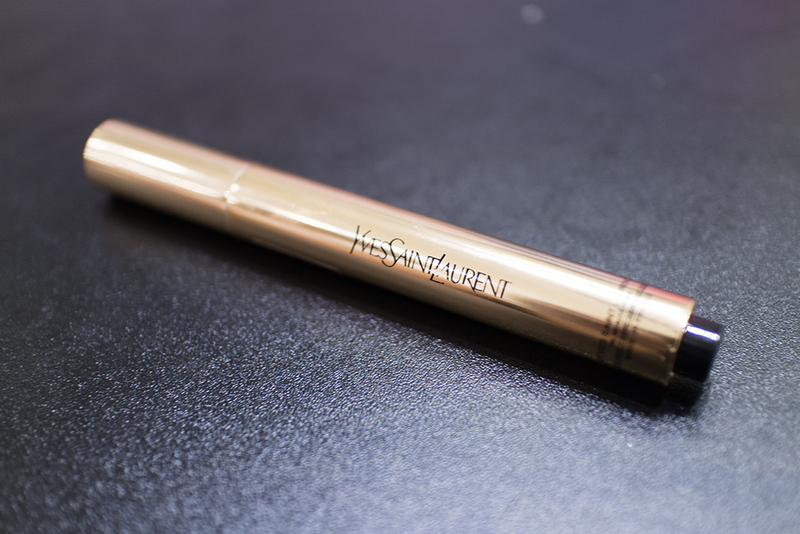 A step that made the most dramatic difference between the day to night look was the mascara! If you can believe it, Chanel’s eyelashes in that photo are completely natural and not even curled. From memory, he only applied a light layer of mascara and didn’t go over it either. 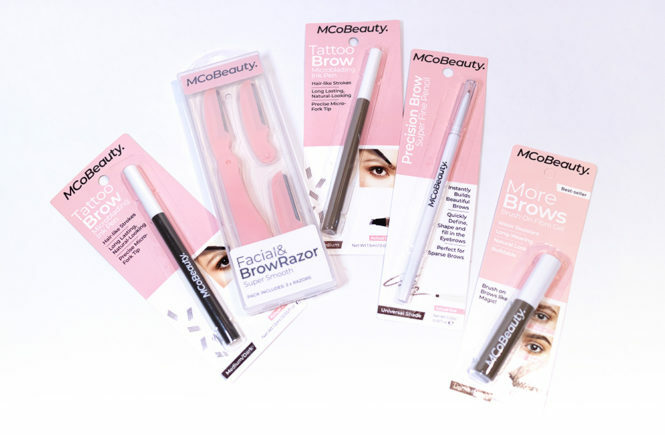 The mascara that he introduced is the below – The Shock. This is another one that I’m really wanting to try out but I’m a bit hesitant because of the price. I do have a lot of mascaras at I still need to use up and, since this product is both pricey and doesn’t come in a mini size for me to test first, I think that I will deliberate a bit more on it. 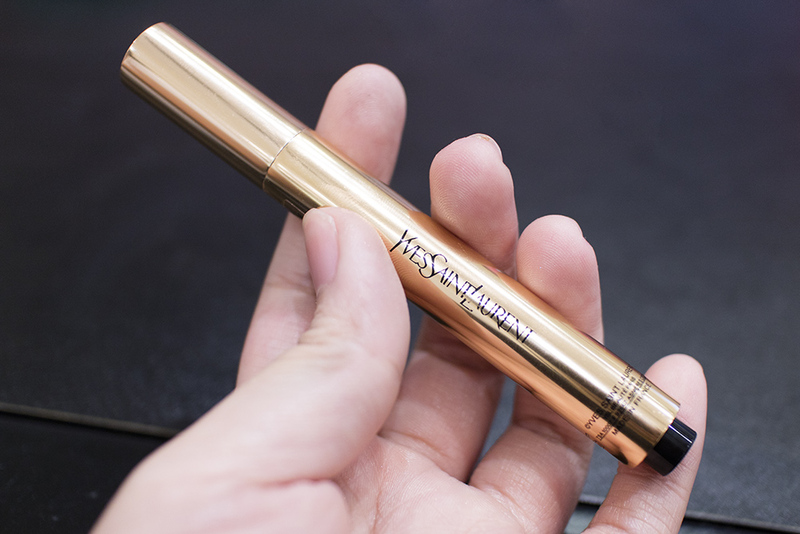 However, I saw first hand how it amazingly darkened and filled her lashes – her eyes are super smoky and stand out without any need for liner. And that was the end of my first day of Masterclasses! 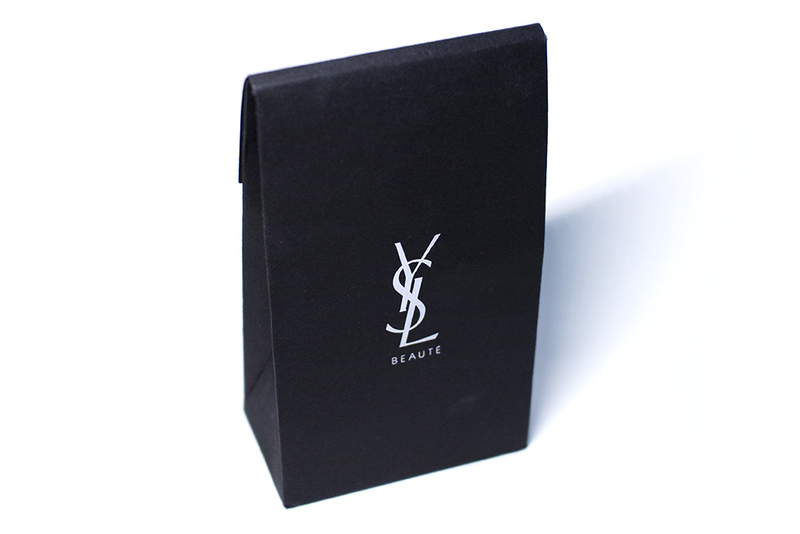 I then went to the YSL table to pick up the gift bags that they had prepared for us. For Tina Yong’s class, which cost AUD$50 a ticket, we received a AUD$50 Myer’s gift card to spend – which is basically getting the money back. I haven’t spent that yet, but I’m waiting for something to really catch my eyes since I’m trying to minimise my spending. 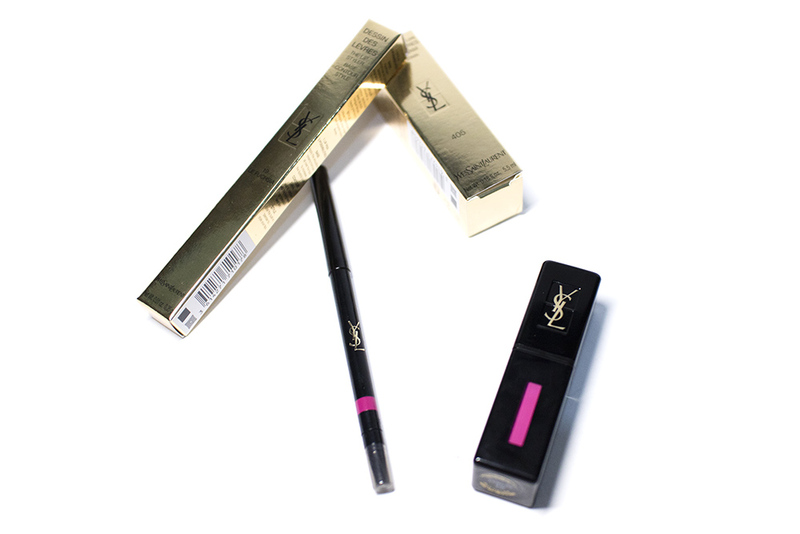 From YSL, I received a Vernis À Levres Vinyl Cream Liquid Lipstick (or a Vinyl Cream) in 405 Explicit Pink, as well as the matching Dessin Des Levres Lip Styler (which is a twist up lip liner and primer) in the matching shade (19 Le Fuschia). I actually wish that they gave us a more neutral shade, since I don’t really wear cool toned fuschias very often, but since I love their Vinyl Cream formulas and I have been looking for something to match with my cool toned eye looks, I’m going to give these a try. 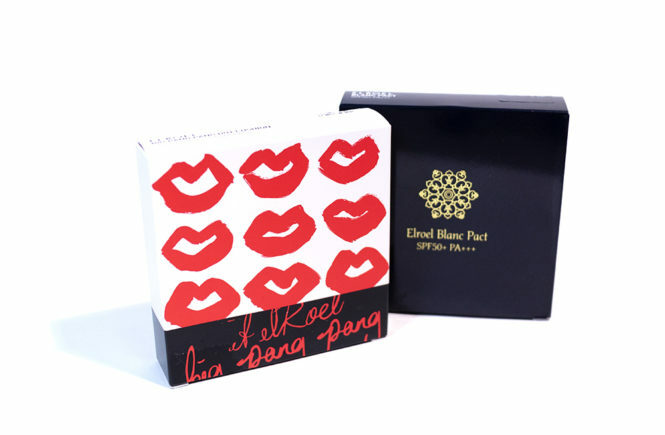 The Lip Cream alone retails for AUD$55 so the gift bag is definitely worth the affordable AUD$25 ticket. I had a great time attending these Masterclasses and I’m eager to see what they will be showing and teaching us on Friday night – though I’m not sure if I will be blogging that one, since it will be after work and I’m usually rather tired.